The abbey of St Peter and St Paul, and the town of Shrewsbury, are the setting for the adventures of Brother Cadfael, the monastic detective hero of the medieval whodunits written by the late Ellis Peters. 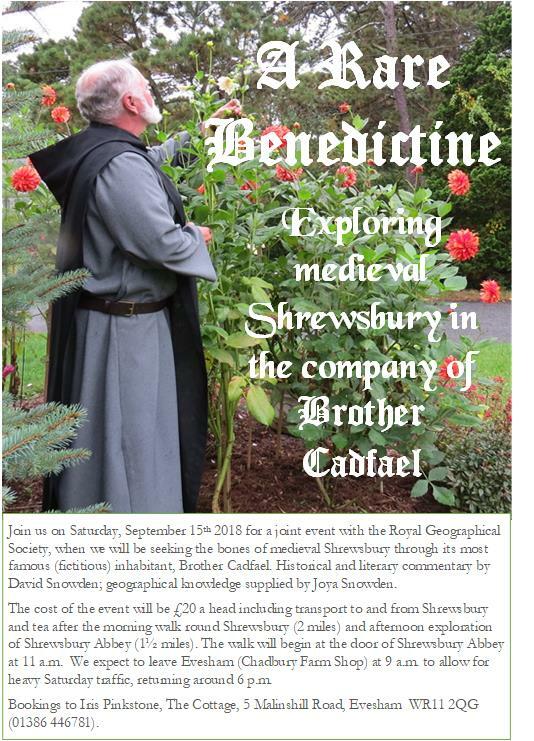 Coincidentally, Brother Cadfael’s era was also the time when Shrewsbury began to develop into a modern settlement. Our walk will be in two parts. In the morning we will explore the development of Shrewsbury, concentrating on the Middle Ages but not neglecting older or more recent points of interest. For Cafdfael fans we will be touching on all of the points of interest in Ellis Peters’ novels, mixing history, geography and literature. After lunch we will look at Shrewsbury Abbey itself, the Abbey Foregate and down to St Giles.